In Colonial India - a world of both Western influence and multiple religious traditions - a young bride needs to be rescued and a neer-do-well thief and swindler named Farhad has been tasked by the gods to rescue her. He won't be alone. He'll have a magic sacred tiger to carry him faster than the wind. But along the way, the hero and his unusual steed will have a series of exotic adventures and they will struggle to accomplish their task. The ending will surprise everyone! An unusual adventure/fantasy epic, full of familiar tropes and expected plot complications, but then utterly original by the end in how it resolves everything. Perhaps the originality is due to the fact that Michaelis is German (the novel was translated into English) or perhaps it is the exotic setting of the story. Either way, the story twists in unusual ways! 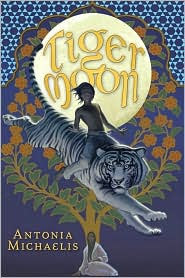 I particularly liked the way that India's multiple religious traditions are worked into the story, making this as much a story about a culture as a series of fantasies.